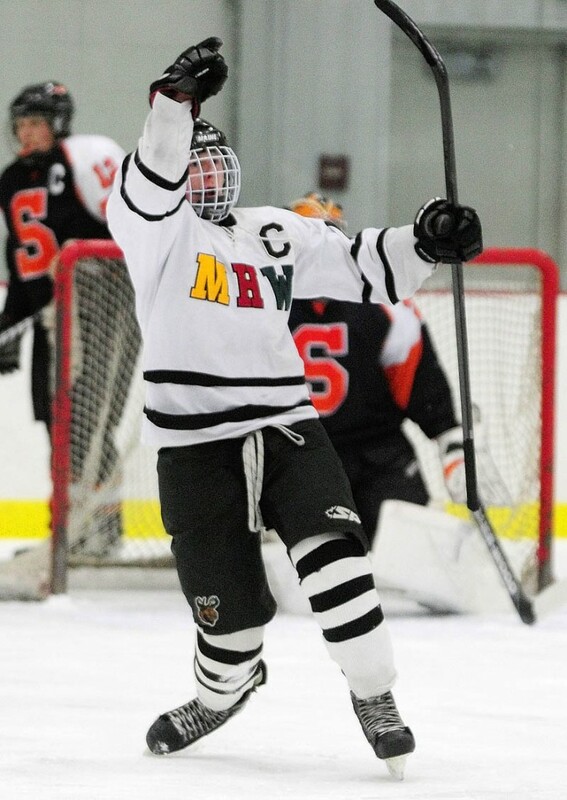 KENTS HILL -- Matt Plourde and Dan Condon are not only quite the one-two scoring punch for the Maranacook/Hall-Dale/Winthrop co-operative hockey team, but in all of Class A.
KENTS HILL — Matt Plourde and Dan Condon are not only quite the one-two scoring punch for the Maranacook/Hall-Dale/Winthrop co-operative hockey team, but in all of Class A. The standout forwards put on another show Saturday in a much-needed 4-1 victory over previously unblemished Skowhegan. Condon and Plourde each had two goals and two assists for the Hawks (7-2-1), who won their fifth straight. Plourde and Condon entered play Saturday with 67 points in nine games. Make that 75 points in 10 games. It was a difficult loss for Skowhegan (9-1-0), which was third in Eastern A Heal points despite not owning a victory over a team with a .500 record or better. They had a chance to earn one Saturday, but were undone by penalties and MHW’s high-flying top line. Kyle Demchak scored the lone Skowhegan goal, which came with 48 seconds left in the second period. MHW led 2-1 after the first period but wasted little time taking control of the game in the second. Condon made it 3-1 with a power-play goal just 15 seconds into the period when he beat goalie Sam Edmondson with a low shot from deep in the right circle. MHW padded the lead about three minutes later when Plourde took a great pass from Bailey Clark and buried the puck from out front. The Indians had lost momentum, and soon they would lose their composure. They were whistled for six penalties after that goal, including a game misconduct to senior forward Jacob Johnson. The Hawks grabbed a 1-0 lead when Condon beat Edmondson from out front after taking a pass from Plourde with 9:30 left in the first. They doubled the lead six minutes later when Plourde scored with a nice wrist shot from inside the right circle.